The Second World War, often described as a “People’s War”, was the first time civilians played a major part in Britain’s war effort. New emergency services created before the war to help those suffering loss and damage were joined by the Home Guard as Britain faced invasion in the summer of 1940 and new organisations formed to deal with unexploded bombs and the homeless caused by nightly air raids in 1940. Major air attacks ceased in 1941 but food was rationed, daily essentials scarce and Britons of all ages expected to do wartime duty in addition to their day job. Many essential war workers on the Home Front lacked a uniform but wore a lapel or pin back-badge to show they were doing their bit for the war effort. Treasured as souvenirs of six momentous years in Britain’s history, they were rediscovered years later, often by someone to whom their significance and meaning was unknown. Whilst military badges are well recorded, no attempt to identify Home Front items was made until the first edition of this book was published privately in 1996. 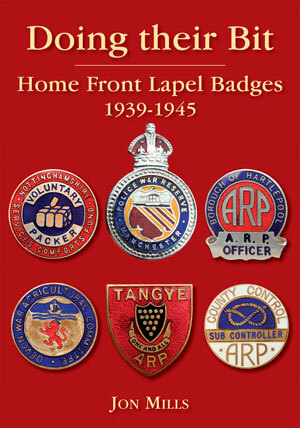 Extensively updated Doing Their Bit is illustrated with over 700 wartime lapel badges and ephemera, records the wartime history of over 200 organisations which wore them and shows how Thomas Fattorini Ltd became a major manufacturer of Home Front badges. This invaluable guide should be on the shelves of anyone with an interest in the history of wartime Britain.